Transistor is a highly stylized RPG with a mix of real-time and tactical combat, developed by Supergiant Games – the same folks that brought us Bastion. The mixture of Real-time action and tactical RPG is fun and engaging. The combat is simple at first but gets a lot more complex as you progress through the game. With each Function (or skill) you attain, it can either be used as the main ability, or as a support to the main ability which can lead to many different combinations. You also gain Limiters, which adds some difficulty to your playthrough. For example, one of the Limiters will give the enemies twice as much power but will provide you with 4% exp. Transistor provides a ton of eye and ear candy. The music is atmospheric music and narrator provides a play-by-play throughout the entirety of the game. The soundtrack integrates so well – in fact – I think it’s easily one of my most favorite video game soundtracks to date. Throughout my playthrough, I admired the environment, to the point I’d often stop and take in the scenery. Some of the cutscenes that provided some flavor context even left me wanting a full-on short film. The writers at Supergiant Games hit it out of the park with the narrative. Red (the main silent protagonist) and Transistor (the play by play commentator sword) form a relationship that challenges that of Romeo and Juliet. A mixture of Real-time action and tactical RPG. 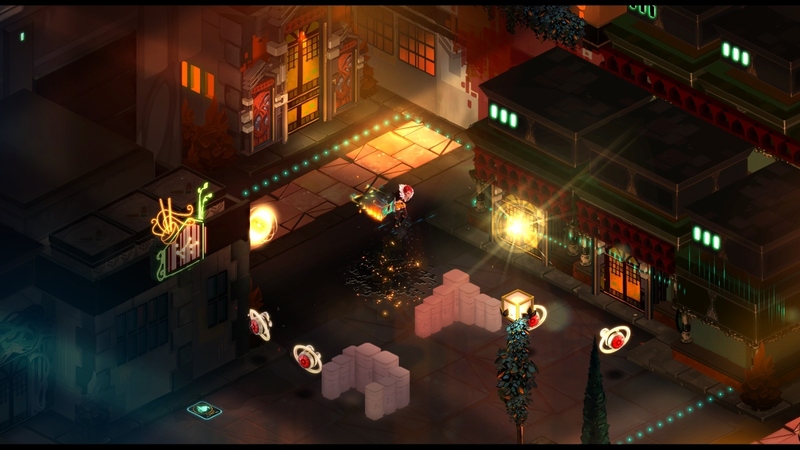 Is it possible that one of the strengths of Transistor can be its weakness as well? The ability to stop time and plan out your attack can come at the cost of being unable to use more of your real-time attacks when time resumes. Basically, the crucial moment after you begin real-time can leave you quite vulnerable. Which leads to the next point, the inability to heal yourself during active combat. I don’t know how many times I said out loud, HOW DO YOU HEAL?!? The short answer is that you can’t, however, there is a skill available midway through the game that will regenerate your health during your real-time combat phase. As I progressed through Transistor the battles seemed to get little stale. The enemies all looked alike and I was pretty much spamming the same attack in the latter half of the game. Although the Functions and Limiters can adapt to your playstyle, it just didn’t help because it appeared as if I was fighting the same robots over and over again. Aside from enemies in the world, there really isn’t much else to make the world feel alive. There are terminals you can interact with to nail down the plot, but otherwise the world feels empty to me. *Perhaps some NPCs could have taken care of that. I hope you enjoyed this Quick Attack video and let me know your thoughts about videos like this. Also, be sure to visit switchrpg.com for all of your Nintendo Switch RPG needs.